Are you going to move soon and you don’t know where and how you’re going to start cleaning your new apartment? Don’t worry because you’re not alone. Most renters went on the same phase where you are right now. An apartment move in cleaning is time-consuming and a tough task. In fact, it’ll be much more difficult if you don’t have any experience in doing it. So, how can you guarantee that you’ll come up with the great result by doing it on your own without making any research about it? As a matter of fact, there are lots of ways for you to do it. And one of it includes which part of the house where you should start cleaning. It could be from the ceiling, walls, flooring and etc., who knows, eh? And just so you know, deep cleaning is a must in every corner of your place. In this way, you can make sure you’re safe from getting sick. You’ll never know if the last person or couple who rented it wasn’t as hygienic as you. So to lighten up your load, here are the 10 tips you can follow! 1. Begin from the top. What we mean by ‘the top’ is the ceiling. You have to consider that not all the mess can be found on the ground of your new apartment. Start by dusting the ceiling corners, overhead lights and ceiling fan. Choose the right duster cleaner that is suitable for your needs. When you’re done, that’s the time you can start working on your way down – walls, windows, baseboards and lastly, the floors. 2. Work toward the entrance. This may be considered as one of the hardest parts of a flat to clean: the main entrance. So, it’s advisable to start mopping or vacuuming on the farthest spot from the doorway. To think that the mess usually comes from the outside, and you don’t want your newly-vacuumed carpet to get ruined! But, when you messed up, just get carpet cleaning services. 3. Deep clean the cabinets. When you finally decided to have an apartment move in cleaning, keeping your cabinets neat is one of the things you need to work on. The dirt and grime that was left by the former tenants can be hard to remove. But, when you’re having difficulty doing it by yourself, you can hire cleaners that have better knowledge when it comes to tidying. 4. Change the toilet seat. Keeping the toilet spotless is highly-necessary. And when you have an apartment move in cleaning, this is one of the things you need to focus on. It’s much better to change your toilet seat to avoid catching any diseases especially if you aren’t sure how frequent does the previous tenants clean their toilet. Do yourself a favour by giving your toilet a brand-new start. There’s no other great feeling to have your own private time soaking in a bathtub especially when you just disinfected it. Obviously, you don’t want to catch skin disease from the former tenant who uses it. You can use dish soap and sponge to remove stains on it or you can hire a cleaner to wipe out the mess that’s tough to clear out. And when you prefer a natural method, you can combine baking soda, kosher salt and borax. And voila! You now have a scrub to make your bathtub as look brand new. 6. Clean your own kitchen appliances. One of the most important parts that you should not miss out on cleaning is your kitchen. Tidy up your cupboard before putting all your kitchenware in there. Clean your microwave not only on the outside but as well on the inside. Wipe out the greasy part in it and don’t forget to clear up the stains on the walls. Then, proceed with your fridge. Wipe all the shelves and be sure to get rid of the stains and dirt. But if the stains are too stubborn, better wash them. Mix water and vinegar and use that solution to wash the shelves. In fact, it works awesome and it is also a food-safe, all-purpose cleaner. Aside from that, washing your dishwasher is also advisable. A natural way to do it is by putting a cup of white vinegar all over the top rack and run it by a cycle – using the hot water setting if you have in your dishwasher. Then, sprinkle a cup of baking soda on the base rack and run a second hot cycle. Also, don’t forget to disinfect all your utensils as well as your sink. 7. Make the floors sheen. 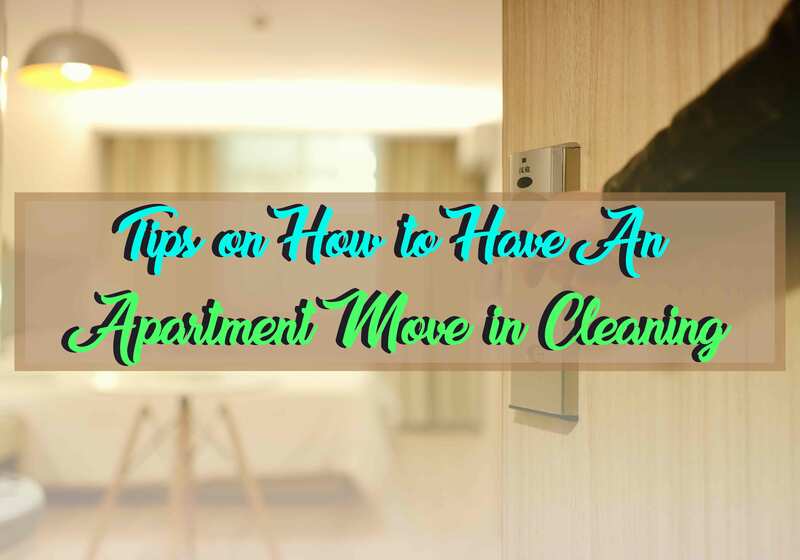 An apartment move in cleaning isn’t as easy as you think it is. Especially when we talk about the floor. Hardwoods, tile or laminate flooring are simple and quick to clean when you use steam mops. When you’re using a regular mop on hardwoods flooring, expect only the worse. You’ll be having a damp and sopping floor. And a good way to clean your floor is by hiring a cleaner that knows how to deal with the kind of flooring you have. 8. Wipe out all the germs as part of your apartment move in cleaning. Germs are everywhere. So, disinfecting every part of your new place that you think the former tenants have touched is necessary. It may be your doorknobs, locks, faucet, etc. Doing so can prevent you and anyone who’s moving with you from getting an illness. 9. Don’t neglect the closets. When you’re having an apartment move in cleaning, make sure that have cleared out the cabinets before placing your newly-washed clothes in it. You’ll never know if the previous tenants left some nasty stains in it so you better wipe them out thoroughly. If possible, put decorative paper or vinyl on it to make your cabinets look more organised. Not only this can add up to your decoration, but also can help you clean up when you move again. 10. Don’t forget your baseboard. Baseboards usually get left out in an apartment move in cleaning. Maybe because they’re unnoticeable, it doesn’t mean they’re safe from dirt. As a matter of fact, that’s where the dirt remained after you wiped the walls out. Baseboards located in your main entrance and kitchen usually get dust and stain so start from these areas. You can use wet wipes or a piece of cloth that can wipe the dirt out. Looking for dependable cleaning company? Maid in Perth is at your service! We cater great deals when it comes to cleaning with bonus tips and hacks. Just visit our blogs and articles for more insights. Also, are you looking for a budget-friendly kind of clean? Check out our article: “Affordable House Cleaning Services Tips: To Do List Before Hiring the Right Cleaning Provider“. This entry was posted in Cleaning Services and tagged After Party Cleaning, Airbnb Cleaning, Apartment Cleaning, Carpet Steam Cleaning, Commercial Cleaning, Deep Cleaning, End of Lease Cleaning, Fridge cleaning, Grout Cleaning, Home Cleaning, Maid in Perth, Move In Move Out cleaning, oven cleaning, Spring Cleaning, Vacate Cleaning, window cleaning.